In September, over 250,000 young students in Singapore joined the National Science Experiment (NSE) jointly organised by the National Research Foundation (NRF) and Ministry of Education (MOE). This large-scale national science project invited students from primary schools to junior colleges to join in. Over 43,000 students from 128 schools took part in this year’s experiment. The students collected and analysed data use a specially-designed pocket device sensor, the SENSg. The SENSg device uses Wi-Fi signals to localise itself, and periodically uploads data to a secured database -if it is in range of a known access point. The data collected by the students is anonymised, and stored securely in the cloud. Students were able to access their data through their personalized big data web portal. Here, they could learn things such as their carbon footprint based on their travel choices. Students walked an average of 5,853 steps each day. Students spent an average of 1.1 hours outdoors each day. 87% of students walked to school or took public transport (bus and/or train). Secondary school and junior college students live two to three times further away from schools than primary school students. These students produced a total of 5.21 tonnes of carbon dioxide daily from transportation taken during NSE. More than 1.8 million unique Wi-Fi access points were detected during NSE. The results of this experiment were used to derive aggregated maps of students’ activities and travel patterns. 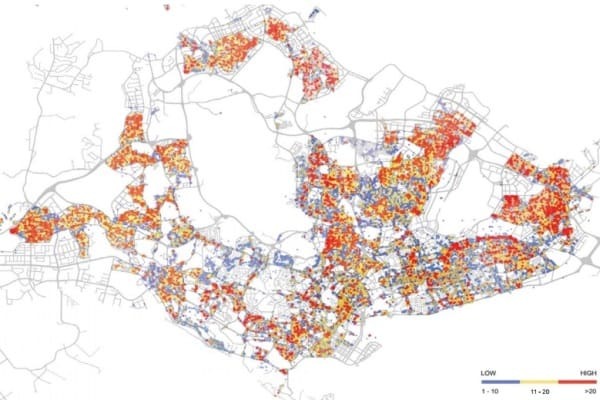 It also was used to map Singapore’s urban outdoor environment such as temperature, humidity and sound, or Wi-Fi connectivity. The information collected was thought to assist public sector agencies in their urban planning. It was also considered to be used towards research programs such as the Virtual Singapore. This programmes is the dynamic 3D city model and collaborative data platform built through Dassault Systèmes’ 3DEXPERIENCECity engine. Students also took on various projects, putting the data they collected to good use. Some projects included: Identifying locations for optimum growth of different species of flowering plants, Identifying dengue hotspots, Identifying ideal locations for LED lights or solar panels, Hong Kah Secondary School students comparing temperature and humidity in the Cloud Forest and outdoor Singapore, and Students and staff of St Gabriel’s Primary School took 7 million steps and raised 50,000 food packs for needy families. The greater aim of the NSE is to excite and interest young students in STEM (Science, Technology, Engineering and Mathematics) by making these subjects relevant to their daily lives. Students will be able to pick up technological, engineering and information technology knowledge and skills, and learn how these concepts intertwine and translate into practical and innovative ideas and solutions that drive a Smart Nation. Going forward, the NSE aims to engage 250,000 students with the project by the year 2017.